Lynn, http://www.vintageswampgirl.blogspot.com/ A vintage picture of her mother, displayed along with the feather from her mother's hat. 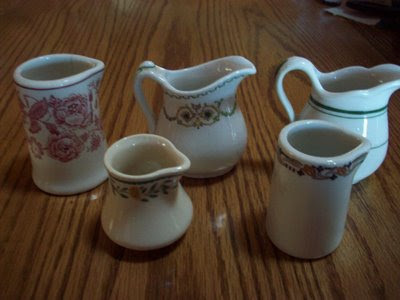 Gail, http://www.cabinhaus.blogspot.com/ A wonderful collection of restaurant creamers. Each piece is unique, and some have restaurant names marked on them. 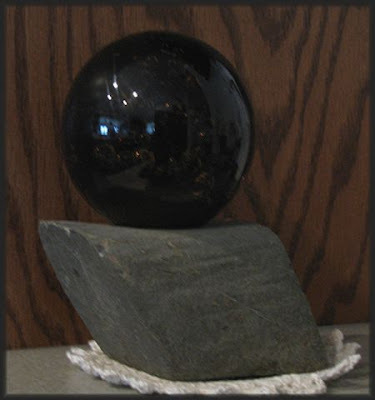 Jeannelle, http://www.midlifebyfarmlight.blogspot.com/ a paperweight made from an unusual rock found on her farm. Like Jeannelle, I usually pick up things on my walks, but I don't think I've ever carted home anything as big and heavy! 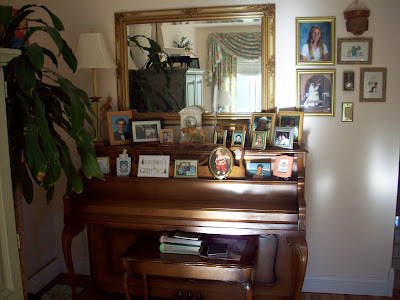 Tara, http://daysmissedonahammock.blogspot.com/ a piano surrounded by family pictures and special mementos. 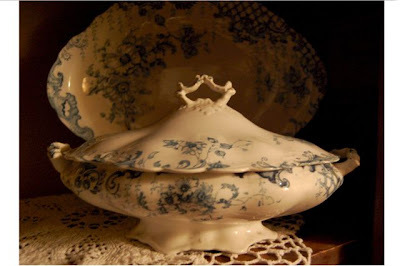 Tara says, "every vignette we make in our homes (is special because) we know the stories in our hearts." 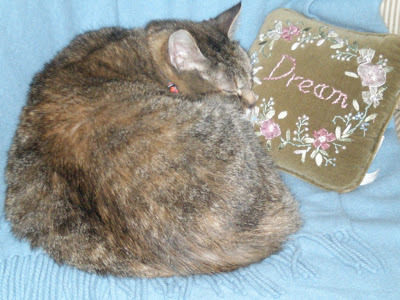 Patty, a pretty embroidered pillow, which seems to have inspired little Zoe! Please stop by again tomorow for our final group of lovely decorating details! That's the way to end.....with an awwwwe moment! The pillow does match the kitty! How cute. This parade is so fun! Love everyone's contribution--all so unique! This is just so cool. I'm really enjoying it Mary. Not to mention, I've finding a handful of sites I haven't visited before. Thanks so much for doing this! As always...so much fun to spy! another great collection of images! TI is so nice to see every ones special things.. This has been such a fun week here! 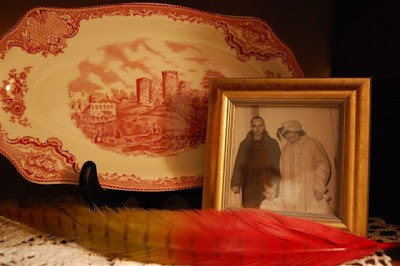 The photo with the actual feather from the hat is an inspired vignette...simply charming. Oh so pretty Mary. I am loving these posts too! I'm loving these parade's, they're tons of fun! Mary, I want to thank you for taking the time that went into creating this lovely parade for us! I'm enjoying it a lot. I am also LOVING -- JUST LOVING your new header. It's incredible. I see photo of the month over at Kacey's. I should not even enter next month! You have some found some beautiful things.Thanks for sharing. More gorgeous favoirites. I ahve to admit I love that kitty! 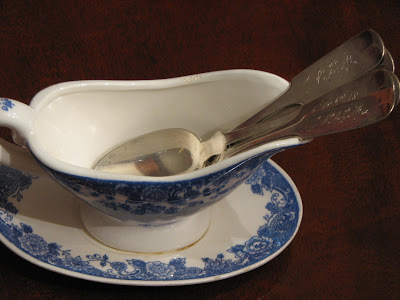 I blogged about my favortite cookbooks today. I hope you'll have the opportunity to tell me what yours are. Its a feast for the eyes to view the lovely items and arrangements! Thanks for highlighting everyone's lovely things. 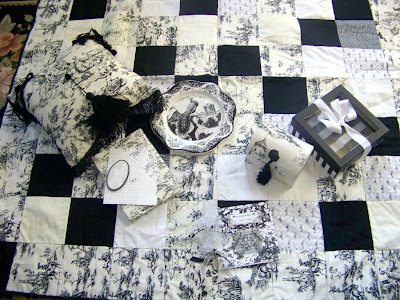 Love all that b&w toile & other b&w goodies that the one person has. Thank you for sharing.